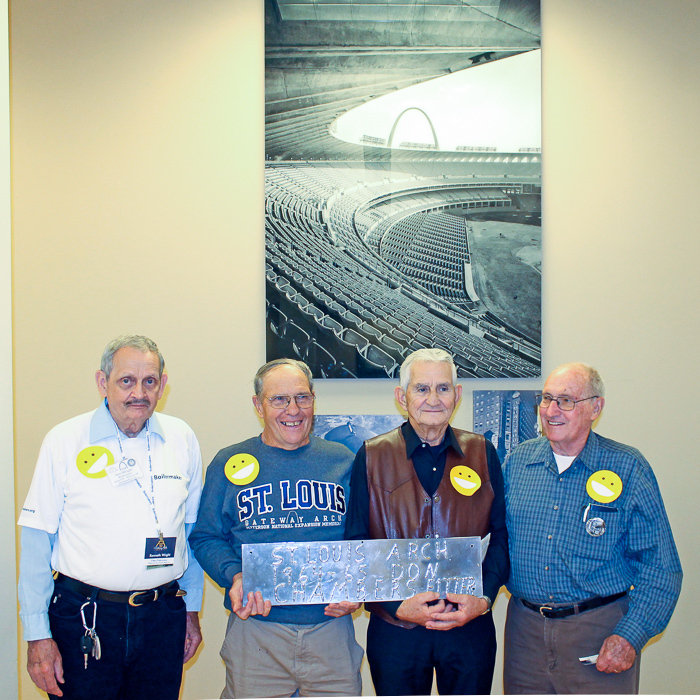 Local 659 members constructed monument sections in Warren, Pa.
A SMALL CONTINGENT of former Boilermakers who helped build sections of the Gateway Arch were on hand at the Missouri History Museum Oct. 28 to commemorate the “topping out” of the national monument in 1965. Fifty years ago, amongst much fanfare, Ironworkers set the Arch’s final section, marking the completion of an incredible feat of engineering and union craftsmanship. Until recently, the role of Boilermakers on the project was lost to time and distance. Pittsburg Des Moines Steel Company (PDM) in Warren, Pa. —where all but the base sections were constructed — was a long way from the St. Louis riverfront. With their work done on the Arch sections, PDM workers represented by Local 659 went on to fill other shop orders and to continue on with their lives. The local disbanded following the shop’s closure years later. In November 2014, Local 659 members finally received the recognition they deserved when the Boilermakers International sponsored a trip to the Arch. For most in the small group still living in the Warren area, it was their first time to see the finished monument. After that trip, the role played by Boilermakers in building the Arch was much better known, especially in the St. Louis area. The few Boilermakers who were able to attend the Oct. 28 golden anniversary of the monument’s completion were treated with dignity and respect during the “Arch Builders’ Day,” an annual celebratory event. It was the first and last such event for the Local 659 retirees. The aging of Arch builders has led to fewer participants, and the Jefferson National Parks Association has decided to make 2015 the final gathering. That doesn’t mean the Boilermaker contingent will stop commemorating their work. They plan to build a stainless steel replica “Baby Arch” to stand at the Warren County, Pa., Visitors Center. For more information, visit www.BabyArch.org. Ed Atwood contributed to this article.